A federal judge slammed Brooklyn District Attorney Charles Hynes Friday for protecting a rogue prosecutor accused of railroading an innocent man on murder charges. The freed man, Jabbar Collins, is seeking $150 million for the 15 years he spent in prison for murdering a rabbi. Hynes' top aide Michael Vecchione - who prosecuted the case back in 1995 - is accused of threatening a witness and withholding evidence for more than a decade that could have exonerated the man . Judge Frederic Block said he was "disturbed" and "puzzled" that Hynes did not punish Vecchione, but instead heaped praise on him despite the serious allegations. "Hynes hasn't treated it seriously, has he?" Block asked a city lawyer at pre-trial hearing. "What has he done? Name one thing he's done in light of Vecchione's aberrational behavior. "This was horrific behavior on the part of Vecchione," Block said. "We are going to have a civil proceeding and all of this is going to be uncovered, I kid you not." The judge peppered city lawyer Arthur Larkin about Hynes' public statements on the case. A key witness who had incriminated Collins in the 1995 murder of Rabbi Abraham Pollack in Brooklyn testified at a hearing last year that Vecchione threatened to clobber him over the head with a coffee table and throw him in jail if he did not finger Collins for the killing. Vecchione is the chief of the district attorney's rackets bureau and is considered one of Hynes' closest aides. Collins' conviction was tossed out last year by another federal judge in Brooklyn, Dora Irizarry, who termed the prosecutors' conduct "shameful" and called the years of incarceration a "tragedy," according to the suit. Hynes decided not to retry him for the murder, but his office has not wavered in the belief that Collins killed the rabbi as he was collecting rent at a building he owned. The suit notes that despite Irizarry's harsh comments, Hynes publicly praised Vecchione in a press release as a "very principled lawyer" who had done nothing wrong and would not face disciplinary action. Pressed about Hynes public statements of support for Vecchione, Larkin, the city lawyer, responded, "I can't speak to that." Collins' lawyer Joel Rudin said he would discuss the possibility of a settlement with the city. "I would very much like the facts to come out, but my client also wants to get on with his life," Rudin said outside court. Block criticized Hynes for exposing the city to significant liability by publicly defending Vecchione instead of disciplining him. He set a trial date of April 8 for a lawsuit. A spokesman for Hynes declined to respond to the judge's comments. Hynes is facing a potentially tough re-election fight next year from at least two announced opponents, including former Brooklyn federal prosecutor Kenneth Thompson. A federal judge chastised the Brooklyn district attorney, Charles J. Hynes, on Friday for defending and promoting a prosecutor in his office whose illegal tactics sent an innocent man to prison for 15 years. Judge Frederic Block made the comments during pretrial proceedings over a lawsuit filed by Jabbar Collins, who was exonerated of murder charges in June 2010 after a judge found that Mr. Hynes’s office relied on false testimony, coerced witnesses and suppressed evidence in the case. One prosecutor, Michael Vecchione, was found to be the driving force behind the case. Mr. Collins, who had been convicted of the 1995 murder of Rabbi Abraham Pollack, is seeking to hold Mr. Vecchione and several other prosecutors personally liable along with the city. He is seeking $150 million in damages. “I’m disturbed that Hynes praises Vecchione after what happened,” Judge Block said Friday in Federal District Court in Brooklyn. “Hynes hasn’t treated this seriously, has he?” the judge asked a lawyer for the city. “Name one thing that he has done in light of Mr. Vecchione’s aberration,” the judge continued. A lawyer for Mr. Collins, Joel Rudin, said he planned to take sworn depositions of Mr. Hynes and Mr. Vecchione. The judge set a trial date of April 8. There was no crusading journalist, no nonprofit group taking up his cause, just Inmate 95A2646, a high-school dropout from Brooklyn, alone in a computerless prison law library. After more than 15 years behind bars and now free after getting his murder conviction overturned, Jabbar Collins starts his day like so many other New Yorkers: He takes the subway to his job in Manhattan. WSJ's Jason Bellini reports. Adrian Diaz testified at trial he saw Collins with a gun. When Collins much later called him, posing as a D.A. investigator, Diaz talked about his route to becoming a witness. Edwin Oliva testified at trial that Collins had said he planned to rob the rabbi. When Collins wrote to Oliva years later, Oliva wrote back describing what lay behind his testimony. Angel Santos testified at trial he had called 911 and said he saw Collins run past. His voice didn't seem to Collins to match any voices on the 911 tape. Joel Rudin helped Collins after his own 10-year legal effort. 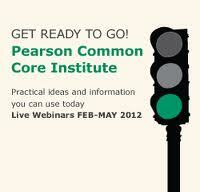 Raginghorseblog: The Real Story About "Common Core"
Remember, Common Core is not a curriculum. Alas, alas…some seem to disagree. For the past decade American teachers have been in the cross hairs of the most well financed, relentless, and hydra-headed public relations campaign against a legal profession in our history. Nothing else even comes close. Indeed, I can think of no other formally respected profession ever so targeted. Anywhere. At any time. This campaign, which masquerades as a movement, was created by and is bankrolled by the richest individuals in the nation and backed by some of the most powerful political figures in the land under the rubric of education reform. Most prominent in the former category are Bill Gates, the Walton family, Eli Broad and any number of hedge fund managers such as instant education expert Whitney Tilson, founder of the egregious Democrats for Education Reform (DFER). 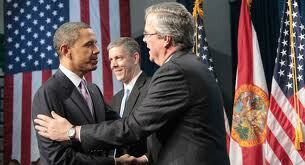 Prominent in the latter category are Jeb Bush, Andrew Cuomo, Rahm Emmanuel and Barack Obama. Despite such powerful figures, the campaign likes to present itself not merely as a movement but as a grass roots movement, spontaneously erupting like a long simmering volcano, it’s gases escaping from the magma chambers of the American educational earth. The campaign is masterful at the creation and propagation of demands and the dissemination of lies, deceptions and false accusations. Central to the campaign is the idea of teacher accountability. Indeed, the campaigners want to hold teachers accountable for their student “a performance”, a performance measured in large part by highly unreliable high stakes tests. Poverty is an excuse and is no obstacle to student achievement. Tenure guarantees a teacher a job for life. Standardized tests are true indicators of a quality education and quality teachers. The real problem with schools is that selfish teachers and their thuggish unions are forever putting their interests over the children they are charged to serve. Of all the lies hurled at teachers ad infinitum, none is more repugnant and underhanded than the last and none gets more mileage by the messianic corporate reformers. It carries within it, albeit in embryonic form, the zero sum ideology of corporate education reform: it is somehow impossible to reach an accord in which both teacher and student are treated fairly and with dignity. For these folks, one side mustdominate the other. That’s simply how life is, you see. This particular lie has been perhaps most effectively (because unconsciously) propagated in the very names of any number of reform organizations: names that in many ways serve as accusations in and of themselves. What conclusion can one draw from an organization that calls itself Children First Network ? Or Students First. Org ? Or Stand For Children ? What conclusion other than someone ( psssssssss… hint: teachers ) or something ( psssssssss… hint: teacher’s unions ) out there is putting these poor kids last ? Except, it seems, when tending to the needs of corporations like Pearson and their (equally misleadingly named ) Common Core State Standards, currently being presented to as the panacea to all that ails American education. Not to mention the millions of dollars to be made in the production and sale of Common Core based tests, Common Core Text books, Common Core guides, and Common Core learning aids and accessories of every conceivable (and inconceivable) kind. But there is a problem in paradise. Somehow in the frenzied production of all these Common Core based paraphernalia, both city and state failed to insure the production of the element most essential to the possibility of the Common Core having any kind of real educational success. Somehow both city and state failed to produce a curriculum. It is difficult to overestimate how grand a failure this is. Imagine, for example, someone trying to sell you a car with a speedometer but no engine. This is, of course, one of the many problems with allowing people with little no educational experience — think Bill Gates, Arne Duncan, Dennis Walcott — to completely remake an education system. But, in typical fashion, it has become the problem, not of those who created it but those who must deal with it. That is to say, teachers. For New York City and New York State, the solution to their failure to provide curriculum for their teachers is to have teachers write curriculum. No matter that it is not the responsibility of teachers to write curriculum. (Teachers are meant to write lesson plans fromcurriculum not lesson plans and curriculum. ) No matter that most teachers most have no idea of how to write curriculum. No matter that teachers are not contractually obliged to write curriculum. (The issue is now in arbitration at the New York State Public Employment Relations Board (PERB.) No matter that teachers have never even seen the test that they are to somehow, magically, write curriculum to prepare their student for. So what if 17,00 New York City schools produce 17,00 different curricula, hodge-podged together by people who have no business doing anything but teaching. So what if the third to eighth grade tests administered in March will be up to two grade levels more difficult than anything the students or their teachers have ever seen before. So what that the New York State Department of Education knowingly decided that millions of children will be forced to take Common Core based high stakes tests of which many haven’t a prayer of passing. So what if this unconscionable incompetence leads directly to demoralizing millions of kids. So what if the same test scores are used to evaluate teachers, principals, and schools and may be used to terminate the former and close the latter. The imperative, it seems clear, is to ram the unproven, untested, unknown entity called Common Core State Standards into the very center of the educational lives of these kids and their teachers as fast as possible, ready or not. Now. Before it’s too late. There’s not a moment to spare. After all, hasn’t Arne Duncan spent the last four years criss-crossing the country enlightening all to the notion that “education is the civil rights issue of our time?” Didn’t Condoleezza Rice declare at the Republican National Convention that education is now a matter of national security? Seen in those glaring lights, the absence of a curriculem seems almost petty. On the other hand, on what planet can this kind of educational malfeasance be considered “putting children first?” And what about that tricky issue of accountability? Who is responsible for this ? How is it possible that a screw –up of this magnitude is allowed to go by not merely without heads rolling, but without barely a peep in the press? Where are the hedge funders weeping copious tears for the poor children now? Where are the apostles of accountability with this travesty? The larger question, of course, is what is the priority here? It is kids or corporations? Is it to help make kids “college or career ready” so as to compete in the ever more savage global economy? 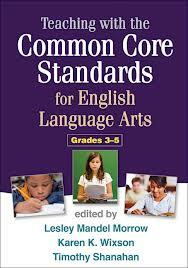 Or is it to shovel millions of taxpayer dollars to Pearson and associates on Common Core accessories before most people even know what Common Core is? “ We’ve been working really hard around Common Core, said Schools Chancellor Dennis Walcott, whose educational experience consists of one year teaching kindergarten. “We’ve been really light years ahead of the rest of the state in terms of the implementation of Common Core but at the same time, we’re ready for the new curriculum to be put in place as well.” Asked when that might be, Walcott replied, “I don’t know. I’ll let you know.” That was last month. He taught kindergarten for a year or so a couple of decades back. So much for putting children first. So much for accountability. 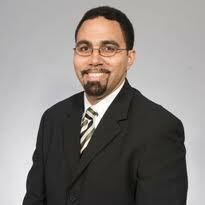 State Education Commissioner John King (whose educational experience consists of teaching for three years) at least provided an answer if a completely unacceptable one. The curriculum will be ready “by Fall, winter 2013, said King. John King who taught for three years. Why is the media not all over this? Where are all those concerned faces found on Education Nation? Why is this not considered a major scandal by all of those pundits forever gasbagging about selfish unions and the holy efficiency of the business world ? The absence of criticism is understandable but not excusable. It is understandable because both the people running the school system and those commenting on those running the school system have no idea what they are talking about and could easily believe a standard is a curriculum. Why wouldn’t they? Many seem to believe that closing down schools and mass firings of teachers are somehow great accomplishments. My fear, bordering on absolute certainty, is that no matter what the real pedagogical value of the Common Core actually is, it will be declared a success. Indeed, it has already been declared so. Unique among federal impositions, contrary to common sense or common decency, there has been no attempt to field-test the Common Core. It is assumed ready to go on arrival. Even, apparently, without a curriculum. 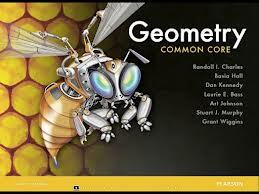 If nothing else the Common Core is a virtual industry on a scale hitherto unknown in American education. We have seen this before, of course in other fields. We have seen it with Goldman Sachs or Fannie Mae or any number of colossi, too big to fail operations that failed anyway and almost brought the entire world down with them. We have just never seen this kind of thing in education before. But then, ours is a time in which there are many, many things we have never seen in education before. As I write the Common Core is being used to lead children to slaughter. Right behind them are the reputations of teachers and principals and entire schools. If you wish to see the abject contempt in which corporate reformers and their employees in elected office hold our children and our families look no further. If you wish to see children being put very far behind immense corporate profits, look here. If you want to see the opposite of accountability, you’ve come to the right place. 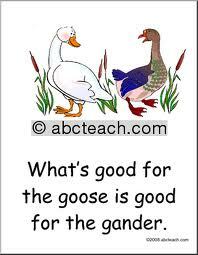 It is a place where what is good for the goose is very, very good indeed for this goose is a very, very golden goose. 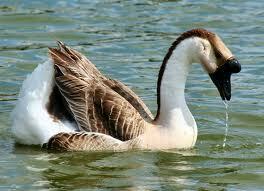 And never you mind the gander.